Hot, Dry Summer /Hawks Aloft Inc.
June brought the beginning of the summer field season for the Middle Rio Grande Songbird Study. It was a hot, dry month in the bosque. Bird numbers were lower than normal at most sites and across most species during June. A particularly disturbing trend seems to be playing out with Black-headed Grosbeaks in the bosque. Up until the past few years, this was one of the more common bosque species during summer. Numbers have steadily declined over the past few years, but the bottom seems to have fallen out this year. 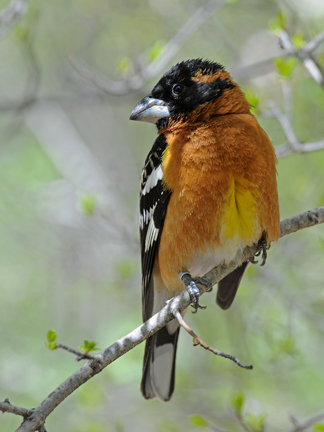 It is difficult to pinpoint the causes of the reduction in Black-headed Grosbeaks, but the ongoing drought conditions in New Mexico are certainly not helping. A noteworthy detection in June was the confirmation of Virginia Rail breeding in the marsh at La Joya Game Management Area. Although we have recorded Virginia Rail at our marsh transects, we have never been certain that the species breeds there. 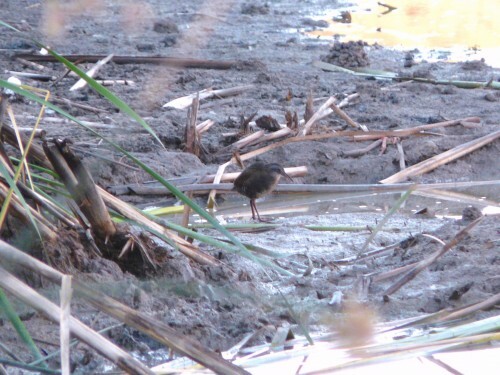 But, on a mid-June visit I observed an adult rail and six little black fuzz-balls foraging in the mud. The adult immediately gave an alarm call and the fuzz-balls scurried into the dense cattails. The steadily dropping water level in the marsh has led to an increase in rail detections. As the water level has dropped, the rails have been forced to come out into the open to reach the remaining pools for foraging. Unfortunately, the marsh is likely to be completely dry within the next couple of weeks. It looks like most of the hatch-year rails will soon be flighted. But the question is, where will they go? Suitable habitat is becoming increasingly scarce as conditions become increasingly dry throughout the middle Rio Grande. Birds are not the only creatures to suffer from the drought. For many species, the drought causes a decline in the food supply, which can result in a corresponding increase in mortality, especially of the young. It also can drive animals into cities in search of food. Let us hope that the recent July rains are an indication of a good monsoon season this year. 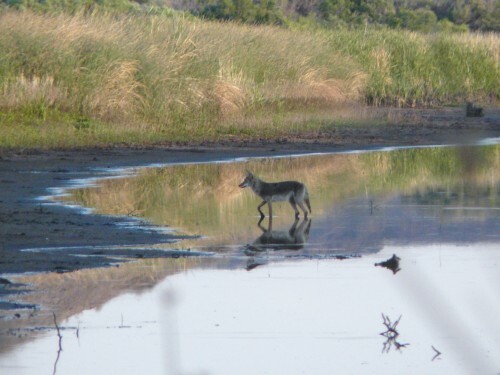 Coyote at La Joya State Game Refuge, crossing the rapidly evaporating marsh.